In 1866 Father Arthur J. Dorris purchased a small wood frame church on Carroll and Hicks Streets from the Episcopalians, formerly St. Paul Episcopal Church. The congregation of St. Paul Episcopal Church built a new, larger stone church to house their community on Clinton and Carroll Streets and they no longer needed the building which Fr. Dorris purchased for his new Catholic community. On April 25 of the same year Fr. Dorris said Mass in the refurbished frame church before a happy and grateful congregation. The solemn dedication was held about three months later when on July 15, His Excellency John Loughlin, the first Bishop of Brooklyn, proclaimed St. Stephen Promartyr, the patron saint of the parish. Although it was the smallest parish, by square miles, in the Diocese of Brooklyn, in a short time that small parish church was wholly inadequate to accommodate the ever-increasing parishioners. During the pastorate of Rev. Edward J. O’Reilly (1872-1889) a most beautiful Church edifice, designed by, Irish-born Brooklyn resident, Patrick Keeley surmounted by a magnificent spire, was erected at the corner of Summit and Hicks Streets. The corner stone of church was laid by Bishop Loughlin in July 1873 and the construction cost totaled $140,000. The new St. Stephen’s was dedicated by Bishop Loughlin on October 31, 1875. Soon it became the New York Bay Church for its high steeple cross illuminated at night, served as a beacon to mariners entering the “bellissimo lago di San Germano” as the Catholic explorer John da Verrazzano once called our bay. The older church was converted into a school and placed under the care of the Sisters of Charity. A lingering disease tortured the last years of Father O’Reilly’s life. 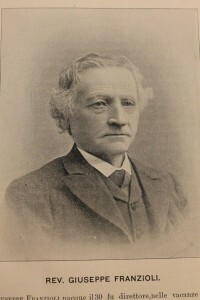 His assistant Father Michael T. Kilahy, was appointed administrator and, after Father O’Reilly’s death on December 23, 1890, Father Kilahy was promoted to pastor. He continued the work of his predecessor and zealously led his faithful and generous parishioners to such high a degree of spiritual life and organizational efficiency as to make St. Stephen’s the best parish in the Diocese. When in 1897 Father Kilahy was called to his eternal reward, the Rev. James H. Mitchell, LL.D., Chancellor of the Diocese and for a time, Secretary to Bishop Loughlin, became the next pastor. Unfortunately, his pastorate lasted a few months. He contracted a cold which developed into pneumonia and ended in his untimely death on April 17, 1898, at the age of 46. This was a sad blow to his parishioners and to the Diocese of Brooklyn, for few priests were better known and more beloved. 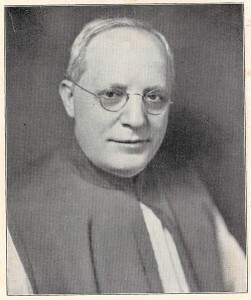 Father Mitchell’s successor was the Rev. Nicholas J. Doran, who had been an assistant at St. Stephen’s for 15 years. Previous to becoming pastor of St. Stephen’s, he had done good service as pastor of St. Mary’s Church, Roslyn, and its dependent mission at Manhasset. In 1904 the Rev. John G. Fitzgerald from his 11-year pastorate of St. Patrick’s Church, Fort Hamilton, was promoted to St. Stephen’s. He remodeled the rectory and built the parochial school which was dedicated on April 26, 1908. 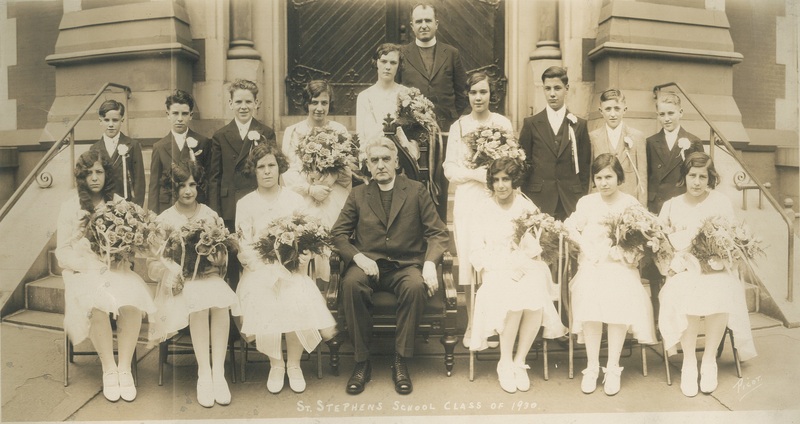 The years following World War I brought a noticeable change in the life and activities of St. Stephen’s: The Catholic people of Irish origin or descent began to move out of the parish. As time went on their exodus took on greater proportions and became almost complete during and after the Depression. During this time of change Monsignor Fitzgerald’s successors, the Reverends George L. Gardiner, Martin J. Biggane and Edward L. Curran, fulfilled their role as pastors effectively as in past years. The newcomers who quickly filled the vacancies left by the Irish were of Italian origins or descent, who for reasons of language and cultural expression, preferred to attend their own Italian National Church and Parish of Sacred Hearts of Jesus and Mary on Hicks and Degraw Streets. They flocked there to hear the Word of God preached in Italian, to attend religious functions as they were accustomed to in their native villages, to receive the sacraments and to find themselves in a friendly, home-like atmosphere, where they could understand and be understood; where they could talk with their priests and chat with their paesani and find new energy to resume the hard struggle of life in this new country. The relatively few among them who chose to frequent the Irish Church of St. Stephen found a sincere friend and generous benefactor in that most talented pastor of our Diocese: Father Edward Lodge Curran. Father Curran is particularly remembered for his great devotion to the Blessed Mother under the title of Our Lady of Lourdes. It was under his supervision that a majestic stone grotto replica like that found in Lourdes where the Blessed Mother appeared, would be built at 106 Carroll Street, to replace the dilapidated original wooden church building that the parish had used as a school. This project was undertaken as an exercise for the young men of the parish in order to keep them off of the streets and out of trouble. Dedicated on the Feast of the Immaculate Conception, December 8, 1935. Father Curran would later build a second Grotto at the parish of St. Catharine of Alexandria which he would pastor following his time at St. Stephen. The story of the first Italian parish to be established on Long Island in the Diocese of Brooklyn, the Church of the Sacred Hearts of Jesus and Mary, began over 125 years ago. It is but one parish, yet its saga says much about the wider experience of Italians in New York. Just as important, this story is also emblematic of the experience of so many immigrants, both then, and today. 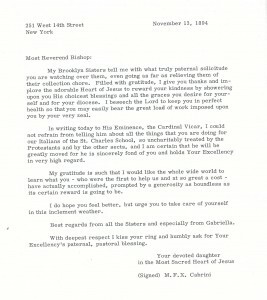 The Catholic Mission of the Italian Colony of the City of Brooklyn was formally begun in the year 1882 under the title of the Sacred Hearts of Jesus and Mary by Fr. Joseph Fransioli. This mission was the first Roman Catholic parish community established specifically for Italian immigrants in the Diocese of Brooklyn, which comprised the whole of Long Island, including the counties of Kings, Queens, Nassau and Suffolk. Sacred Hearts was established as a national parish that served neighborhood parishioners but also welcomed all Italians. Initially, the new Italian parish occupied space belonging to St. Peter’s church, at the corner of Warren and Hicks Streets. 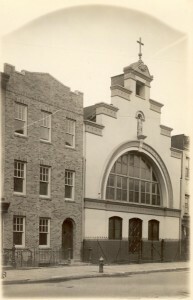 In order to be closer to the center of the Italian Community a new building for Sacred Hearts Parish opened in May 1885 on President Street off of Van Brunt Street. During the time on President Street Mother Cabrini came to work at the parish of Sacred Hearts of Jesus and Mary. Recognizing a need to educate the Italian immigrant children, Mother Cabrini and her sisters established a school in the parish in 1892, which was placed under the direction of her order. Brooklyn’s Bishop McDonnell bought a former church building to be used as the school on Van Brunt Street from the Moravian church. It was named the St. Charles School. By 1900 the number of Italian immigrants living in the vicinity of the President Street church was the largest single concentration of Italians in the country. Convinced of the need for a larger church, Father Vogel found property on Degraw and Hicks Streets to build a new larger church. Upon completion of the new church, Father Vogel felt it necessary to keep the prior church building at President Street open to serve the community as a chapel for the parish under the title of Saint Charles Chapel. In 1921, a new pastor of Sacred Hearts, Monsignor Alfonso Arcese, realized a larger school was required to meet the demand of the thousands of local Italian children. 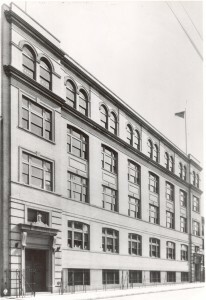 The Sacred Hearts of Jesus and Mary School opened its doors under the direction of Mother Cabrini’s order, the Missionary Sisters of the Sacred Heart, in September 1922. In the late 1930s, rumors emerged that a new spur to the Belt Parkway connecting it with Atlantic Avenue was planned along Hicks Street. A project of the great—some would say infamous—urban planner of New York, Robert Moses, construction of this highway would mark one of the greatest changes in the history of the parishes of St. Stephen and Sacred Hearts of Jesus and Mary. 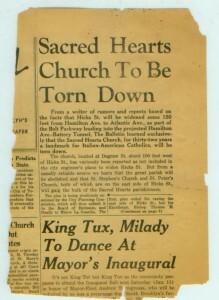 To make room for what would become known as the Brooklyn-Queens Expressway (BQE), the Church of the Sacred Hearts of Jesus and Mary was to be demolished, along with the other two earliest Italian parishes established in Brooklyn, Our Lady of Mount Carmel and St. Michael the Archangel. The Italian community lobbied Archbishop Thomas Molloy to save the church, or to allow them to build a new one, but the Archbishop knew that the Moses project could not be halted. The Archbishop mandated a merger between the parish of Sacred Hearts of Jesus and Mary and the parish of Saint Stephen. The pastor at Sacred Hearts, Father Arsenio Caprio, helped guide the Italian community through the integration of the parishes, the difficulty of which was eased since many of the Irish-Catholic families had moved away. Italians had stayed, taking over a neighborhood and a parish where many early Italians were once not considered welcome. 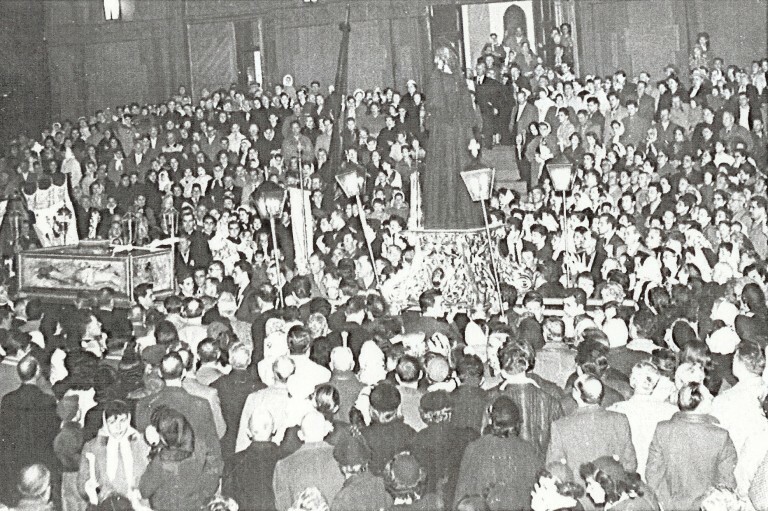 On the morning of December 7, 1941—the same day that, some 6,000 miles away, the Japanese launched a sneak attack on Pearl Harbor—a final Mass was celebrated at Sacred Hearts of Jesus & Mary Church, followed by a grand procession of the parish’s Italian Societies, the statues of their patron saints held aloft, on their shoulders, to their new home at St. Stephen’s Church. It was a somber occasion; after four years of rumors, the parishioners realized that the church built brick by brick by their immigrant parents would be destroyed. But in the midst of this sorrow, they were grateful to Archbishop Molloy who had given them St. Stephen’s Church. The location had changed, but the church was the same Catholic Church, founded by the Son of God. They, therefore, took the new parish to their hearts. The task of setting the new parish of Sacred Hearts – St. Stephen in motion fell into the capable hands of Father Arsenio Caprio, who with Christ-like zeal completely redecorated the Church edifice and in 1946 erected the present main marble altar and dedicated it to the memory of his parishioners who had made the supreme sacrifice during World War II. On August 11, 1948, Fr. Caprio was called to his eternal reward. His successor was no stranger to the parish, for, Monsignor Alfonso Arcese had been pastor of Sacred Hearts of Jesus and Mary for nearly two decades until 1940, and had built the imposing 24 classroom parochial school located on Hicks Street, between Degraw and Kane Streets. It is at this location that the parish school of Sacred Hearts of Jesus and Mary remained under the direction of the missionary Sisters of the Sacred Hearts of Jesus. To provide social, athletic and recreational activities to the youth of the parish, Monsignor Arcese transformed St. Stephen’s school into a parish Youth Center and appointed as its director his very capable assistant the Rev. Francis Ricigliano. On December 28, 1949, Monsignor Arcese, the outstanding Italian-American pastor and leader in our Diocese, died of a heart attack. He had the presentiment of his approaching death: for, three days before, as he finished the Christmas Midnight Mass and from the sanctuary walked to the sacristy, he turned to his beloved parishoners and feebly said: “Goodbye everyone, this is my last Christmas.” His loss was deeply felt by his great friend Archbishop Molloy, the clergy and entire Diocese. He was succeeded by Father Francis Del Vecchio on February 2nd, 1950. Before the completion of his first year of his pastorate disaster struck. At 3:00 p.m. in the afternoon on the crisp Wednesday afternoon of January 10, 1951, the clock in the tower of what was now known as Sacred Hearts & St. Stephen’s Church rang only twice instead of the usual three times. A fire had broken out in the choir loft of the church and had reached the electrical system. Smoke was seen rising up from the vast span of the roof. Neighbors and parishioners immediately rushed to the scene in disbelief. One of the parish priests threw open the front doors of the church and ran into the burning building to retrieve the consecrated hosts. It is said that as he exited the church with the Blessed Sacrament, the roof caved in behind him, destroying the church. This was a disaster unequaled in the church’s history. 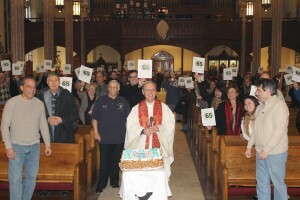 Going door-to-door, men, women and children collected the necessary funds to rebuild the church, during which time Mass was celebrated in the auditorium of the former St. Stephen School building which Msgr. Arcese had turned into the parish youth center. 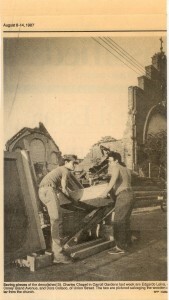 The parish was even assisted by donations from local Jewish and Protestant congregations. Rising from its ruins more beautiful St. Stephen’s Church was rededicated by Most Reverend Archbishop Molloy on Sunday, November 23, 1951. His Excellency, the Most Reverend James H. Griffiths, who had been baptized at St. Stephen’s, preached the Rededication. On the same glorious day, His Excellency, Archbishop Molloy blessed the new two-story rectory building. The new rectory was built at his request next to the church because the former rectory had been located at 25 First Place, preventing the parish priests from noticing the fire until it was too late. The new rectory would be built on the land original occupied by the first parish rectory and original wood framed church and most recently by the Grotto of Lourdes. 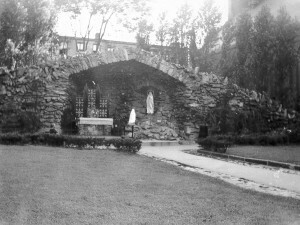 The Grotto would be demolished to build the new rectory. As a gesture to those with great affection for the Grotto, however, a replica Grotto was installed in the lower church sanctuary of St. Stephen Church and the original stones were used to create a large planter in the church yard. Five years later, in 1957, the renowned artist Theodore V. Pizzuti was called on to decorate the interior of the church edifice. He was inspired by our parish children in painting the angles high above the Sanctuary. On November 8, 1959 the Most Reverend Bryan J. McEntegart dedicated St. Stephen’s High School, which was directed and staffed by the Sisters of the Catholic Apostolate known as the Pallottine Sisters. St. Stephen’s High School was a co-educational High School with academic and commercial courses. It was awarded the University of the State of New York Education Department Charter on September 1, 1963. The former rectory located at 25 First Place was remodeled and became the Convent of the Pallottine Sisters teaching in the high school while the Missionary Sisters of the Sacred Heart who continued to teach in the parochial school lived at 580 Henry Street. Father Delvecchio lamented that much of his parish lived near and around the site of the former Sacred Hearts of Jesus and Mary Church building and current school five blocks away from St. Stephen Church. For this reason, upon hearing about the sale of the former Strong Place Baptist Church building by that congregation on Degraw Street and Strong Place, Father Delvecchio purchased it. Once he obtained permission from Bishop Mugavero, since the new chapel building was in the boundaries of another parish and one block out of his, he refurbished and consecrated the chapel Mother Cabrini Chapel. The chapel was used for regular Sunday Mass and the celebration of sacraments for those families living close to the school only one block away. In 1978 St. Stephen High School graduated its last class. In the coming years the school building would once again find new life as the home of Sacred Hearts – St. Stephen parochial school. Faced with diminished enrollment the former Sacred Hearts of Jesus and Mary School building was too large for the new school population and too old to maintain, so it was sold in 1984 and converted to condominiums. Sacred Hearts – St. Stephen Parochial School remained the last Catholic school in south Brooklyn until its eventual closure in 2006 in the face of rising costs and changing community demographics. In 1981 Father Francis Delvecchio was named a monsignor by the now Saint John Paul II. The 1980s brought a more contemporary look to the interior of St. Stephen Church. In an attempt to be in alignment with the new guidelines set forth during the Second Vatican Council in the 1960s, the Altar of Sacrifice was removed from the High Altar and brought forward so that the priest could face the people in the church during Mass. 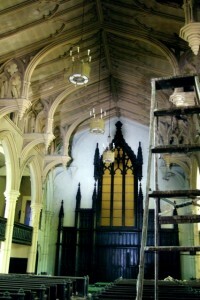 The pulpit which rose high on a stand overlooking the church was taken off of its base and placed directly on the level of the sanctuary floor. The Altar rail was removed from the center of the sanctuary and a new carpet replaced the marble floor. Lastly, the detailed stenciled painting and gold embellishments which once graced the walls of the church were painted over and made white in an attempt to bring the focus away from the church space and more on the actions within the Mass. In 1986 he was the first pastor of the parish to retire, which is required under Cannon Law upon a pastor’s 75th birthday. Although he moved out of the pastor’s suite on the second floor, he did not leave the parish, but instead took smaller rooms on the first floor where from his window he was able to watch the school-children play in the yard. Msgr. Delvecchio remained a force in the parish for the next three years helping to form the new pastor Monsignor Anthony S. Danna in the culture and traditions of the parish. On April 13, 1989, Msgr. Francis Delvecchio was ushered home to the Lord, we pray, by the angels of God. It was difficult for Monsignor Anthony Danna to succeed Monsignor Delvecchio who had rebuilt the burnt church, built a rectory, a high school and had been a friend to all. However, Monsignor Danna was up to the challenge and tried to respond to the changing needs of the parish in a modern era. 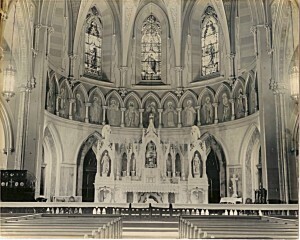 Since the time it had been built in 1884, the first permanent home of Sacred Hearts of Jesus and Mary parish, now known as St. Charles Chapel on President and Van Brunt Streets, remained in use by the parish as a chapel for Mass and the celebration of the sacraments. In August of 1987 the historic President Street church building was demolished following a roof cave-in, as were a majority of the buildings on the surrounding blocks. While some items were salvaged from the building by the local parishioners, much was lost. This site, where Mother Cabrini first ministered to the poor immigrants of the Italian community of Brooklyn, today is the location of Mother Cabrini Park. The second of the parishes two chapels, Cabrini Chapel, located on Degraw Street, was closed in 1997 after this building too was found not to be safe enough for the celebration of Mass. The wood appointments and pews in the chapel to the left of the Altar in St. Stephen Church today were all salvaged from this chapel and installed over time from 1998 to today. As Italian immigrants and their children gained a better life through education and economic opportunities, many left the railroad apartments of South Brooklyn for lawns and pitched roofs in Long Island, Staten Island, New Jersey and other, more upscale Brooklyn neighborhoods. Those taking the place of the Italians were young professionals making a home for their young families in New York City. Following Monsignor Danna in 1998 was Father Anthony J. Arccirito who during his three years as pastor began a great renovation and restoration effort to correct years if damage cause by the vibrations of the BQE Expresway while bringing St. Stephen Church building back to its original glory and majesty both inside and out. He also reestablished the parish youth program and grew it to over 400 families while also increasing the Sacred Hearts – St. Stephen School population to 320 students, the most it had seen in a decade. Father Anthony J. Sansone continued the effort to beautify the church building when he arrived in following Easter in 2001. However, no one could have known how much our neighborhood, city or world would change that September 11, 2001 as Father Sansone watched with the school church from the back windows of the school as the World Trade Center fell. He continued to pastor the parish through that great period of uncertainty and watched as many families decided to leave Carroll Gardens and Brooklyn for a different life leading to the close of the parish school in 2006. Monsignor Guy A. Massie, our current pastor, arrived to the parish in 2013. Raised in a predominantly Italian-American enclave himself, Monsignor Massie has said he feels like he is back home at the parish. Today, those Italian-Americans who remained in the Carroll Gardens neighborhood form the foundation of the Sacred Hearts-St. Stephen parish community, while hundreds of others still flock to the parish from outlying areas on special occasions. The annual Good Friday procession that precedes the celebration of Easter Sunday is one of the oldest in the diocese and remains one of the most visible expressions of a community that continues to flourish by drawing on deep roots. Additionally, Msgr. Massie’s efforts have seen greater lay participation and numerous social and community activities flourish under the direction of the parish. He prides himself of the model of “parish” as “family” and sharing “faith” not “religion” with all who enter the doors of the church. He too has been a kind steward of St. Stephen Church believing that by giving its parishioners a greater sense of responsibility for their church, they will take greater care of it making it a place where all are welcome for generations to come.